EastWest Bank Gives Away a Samsung N150 Netbook in October and More Gadgets in the Coming Months! Since its birth in 1994, EastWest Bank - a subsidiary of the Filinvest Development Corporation (FDC) - has established itself as one of the Philippines' most stable and fastest-growing banks. The Bank currently has more than 120 branches nationwide and proudly bears the title as the the sixth largest credit card issuer and the sixth largest service provider of auto-financing in the country. EastWest Bank continuously develops innovative products and services and alternative delivery channels to meet and answer its clientele's ever-evolving needs and demands. Furthermore, EastWest Bank continues to take concrete steps geared towards fulfilling its ultimate goal of becoming a world class bank anchored on service excellence. So be smart about your money and start a savings or checking account with EastWest Bank! Banking with a world-class bank like EastWest not only secures your future but it also gives you peace of mind. To make the deal even sweeter, EastWest bank is giving away gadgets among other prizes every month to lucky Checking Account and Savings Account depositors with a total increase in month-to-date average daily balance (MTD ADB) of PHP 50,000.00. Depositors who meet this requirement get one (1) raffle ticket. All tickets will also be valid for the Grand Draw to be held on April 13, 2012, where a one single-bedroom unit in Beaufort with parking space awaits the lucky winner! So what are you waiting for? Join the promo now by updating your customer information with your depository branch! The promo runs from October 05, 2011 to March 31, 2012. 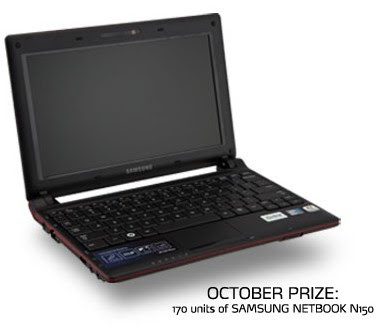 For the month of October, EastWest Bank is giving a gorgeous Samsung N150 Netbook! If you remember, we've featured Samsung N150 on TechPinas and I have to say that it remains to be one of the best netbooks out in the market today. Keep checking TechPinas for more about the monthly gadget prizes and big, big grand prizes that EastWest Bank is giving away!